Combine all ingredients in a heavy bottom stock pot. Cover and let simmer over low heat for half hour to blend flavours. 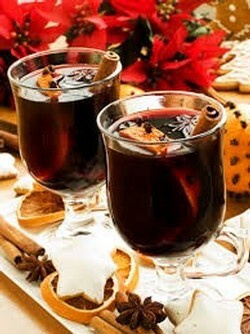 Remove fruit and spices and ladle into mugs. FREE SHIPPING. One Day Only. Canada Day. Anywhere in Canada. We are celebrating Canada's birthday with our own special Red and White Day! Starting at midnight on June 30, 2015 and ending at midnight on July 1, 2015 order a case (12 bottles) of any of the following wines and receive FREE SHIPPING! We understand that with any technology there can be hiccups. If you experience one of those hiccups please send us an email to winery@tinhorn.com with your order and contact info, and we will get back to you on July 2 to process your order (emails must be have been sent / received on Canada Day July 1). 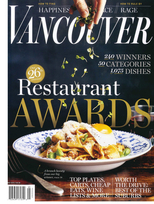 Oliver, BC (April 22, 2015) – Miradoro Restaurant at Tinhorn Creek, was honoured with a gold medal for Best Winery/Vineyard Dining, for the fourth consecutive year at yesterday’s 26th Annual Vancouver Magazine Restaurant Awards. Vancouver Magazine describes Miradoro's Chef Jeff Van Geest as having "dug himself deep into the South Okanagan terrior, delivering authentically wholesome, unpretentious comfort food that mirrors the Tinhorn cellar uncannily. Anything from the wood-fired oven (starting with locally topped pizzas) is a win." Restaurateur and co-owner Manuel Ferreira says that Miradoro's goal has always been to create an exceptional and authentic all-around dining experience in the South Okanagan. "We have always striven to maintain the highest standard of service and this award reflects the tireless dedication from both Chef Jeff Van Geest and our entire team. We at Miradoro are humbled to have received this accolade for the past four years”. Held at the Sheraton Wall Centre yesterday the announcement of this prestigious award serves to reinforce Miradoro’s position as the Okanagan’s leading dining venue; celebrated for it’s creativity and commitment to local and sustainable produce its spectacular setting offers panoramic views of the vineyards, farms and lush valley below. At Miradoro Restaurant the Mediterranean-influenced wine country cuisine showcases the region’s finest ingredients alongside the award-winning wines of Tinhorn Creek Vineyards. Perched on the picturesque winery estate on the famed Golden Mile, the destination restaurant offers stunning views of the South Okanagan Valley. Its unique design seamlessly integrates a modern look with the natural landscape and the more traditional design of Tinhorn Creek’s winery and barrel cellar. The 4,000-square-foot space features 65 seats indoors and 65 seats outdoors on a wraparound deck, ample use of natural woods and cork creates a room that is simple, elegant — and lets the food, wine and view be the stars of the show. Miradoro Restaurant is open for lunch daily from 11:30am–3:00pm, for tapas from 3:00pm-5:00pm and for dinner from 5:00pm–9:00pm. For more information, please call 250-498-3742 or visit www.miradoro.ca.